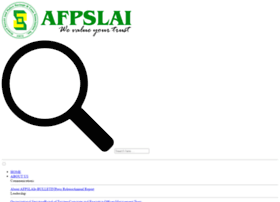 afpslai.com.ph at WI. Armed Forces and Police Savings & Loan Association, Inc.
Armed Forces and Police Savings & Loan Association, Inc.
AFPSLAI is a private, non-stock and non-profit savings and loan association. It is supervised by the Bangko Sentral ng Pilipinas and one of the leading providers of financial products and allied services to the AFP, Army, Air Force, Navy, PNP, BFP and BJMP.